Eyewitness: "Then came an earthquake so horrible and ghastly that the soil undulated like the waves of a stormy sea, and the mountains danced as if drunk, and the city collapsed in one miserable moment killing more than a thousand people." 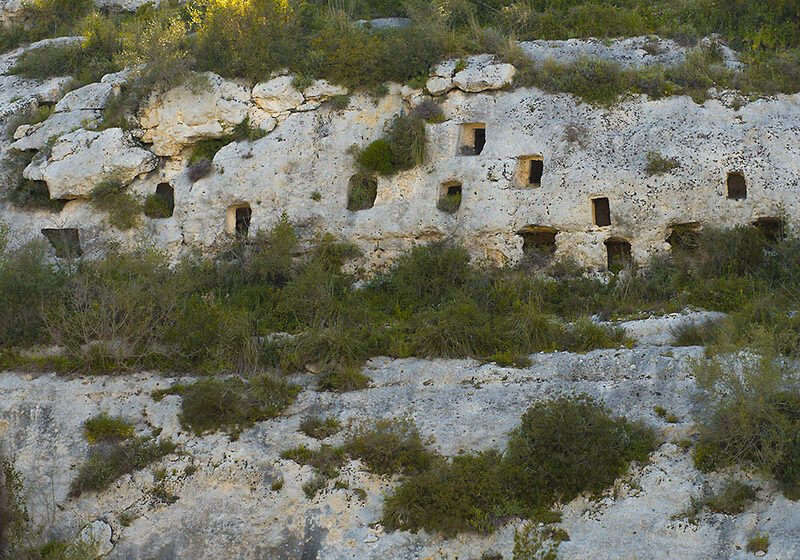 Noto Antica was a city of Sicel origin; Sicel tombs can be seen to the left as you approach the ruined city. 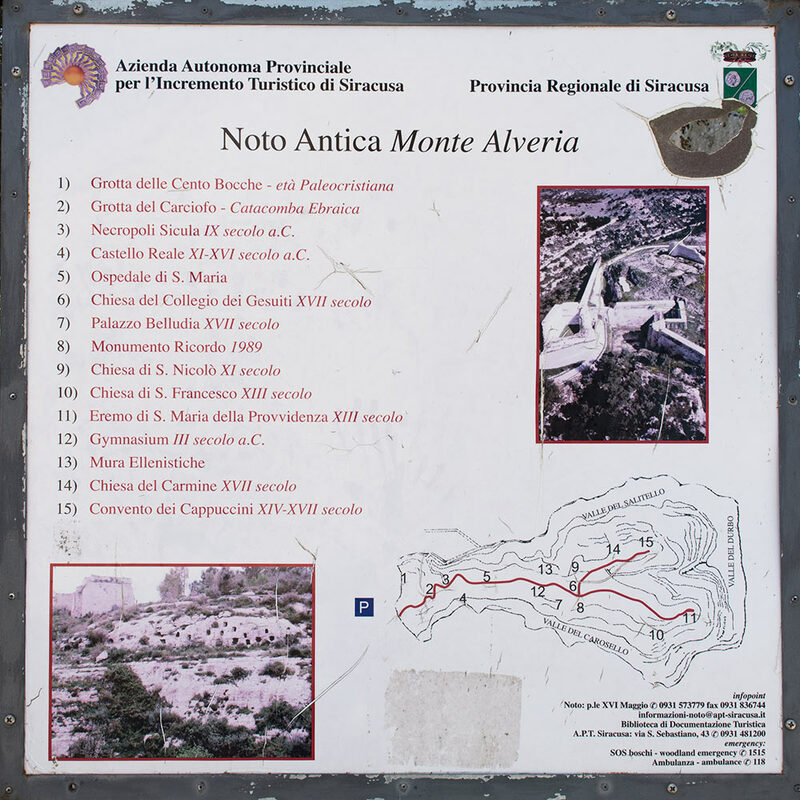 Noto Anica lies about 10 kilometres to the north of the baroque city. It was built on Mount Alveria. The Romans called it Netum. According to legend, Daedalus stopped here after his flight over the Ionian Sea, as well as Hercules, after his seventh task. In the Roman era, it opposed praetor Verres. 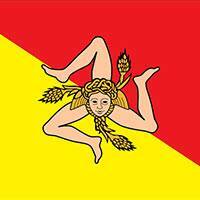 In 866 it was conquered by the Arabs, who made it a capital city of one of three districts of the island (the Val di Noto). In 1091, it became the last Muslim stronghold in Sicily to fall to the Normans. 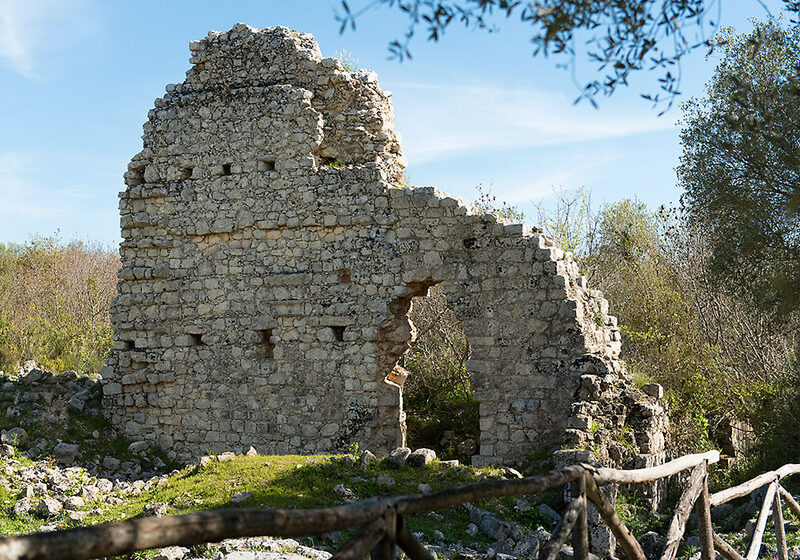 "The scant ruins, reduced to rubble and overgrown, are very romantic and provide inspiration for artists, photographers and writers," The Blue Guide Sicily states (p. 352). To me, Noto Antica was one of the few disappointments during my stay in Sicily in 2015. I found few visually interesting motives to photograph, and felt that the place lacked intensity. Part of the high wall in Noto Antica, next to the Parking. Chiesa e Collegio dei Gesuiti, Noto Antica. Tourist information at Noto Antica. Noto Antica was a city of Sicel origin; Sicel tombs from c. 9th century BC can be seen to the left as you approach the city. 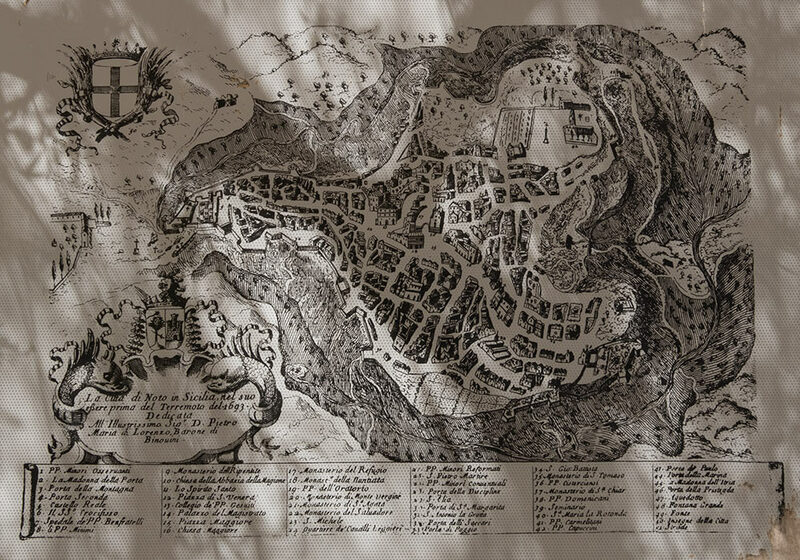 Map of Noto, made a couple of years before the earthquake in 1693 that destroyed the city. New life growing in the ruins at Noto Antica, totally destroyed by the earthquake that struck Sicily 11. January 1693. 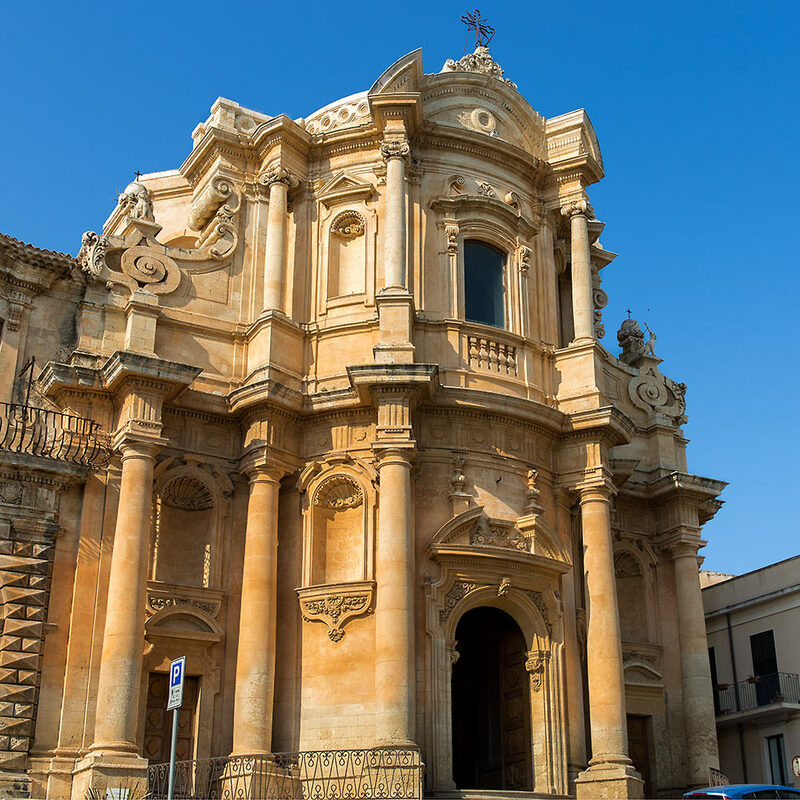 Noto was rebuilt in the baroque style, some 10 kilometres away. In the background you see the old castle. The Castello Reale dates from 1091, built by Duke Giordano, son of Roger of Altavilla. In 1430 it was expanded by Duke Peter of Aragon, and then modernized in 1545. In 1675 it was provided with guns during the Franco-Spanish war. 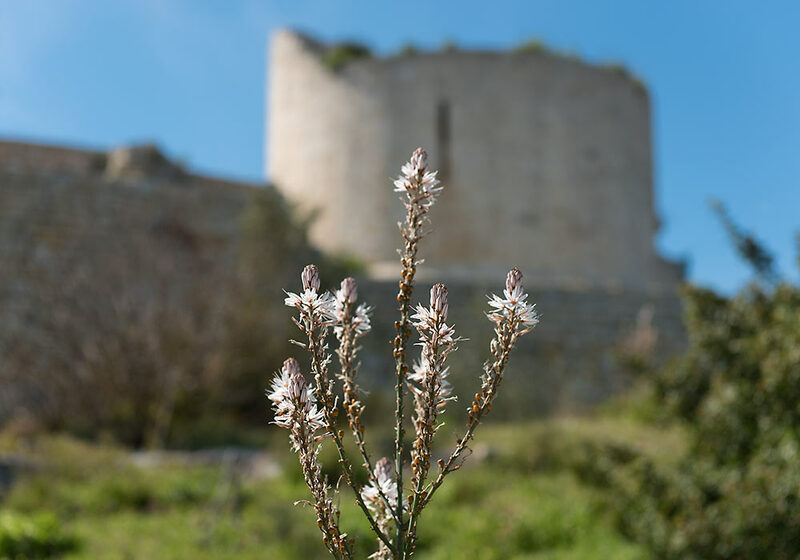 New life growing in the ruins at Noto Antica. 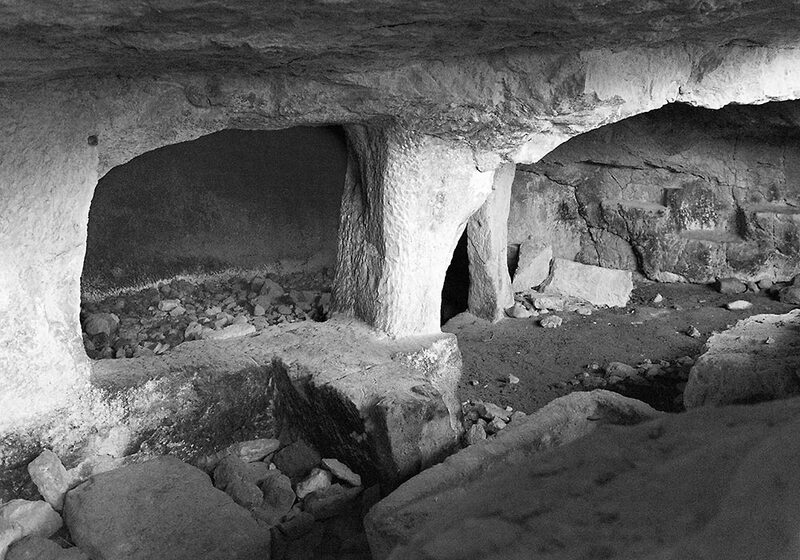 I am not sure whether this is a prehistoric dwelling or a burial place. I saw several of these in Noto Antica. 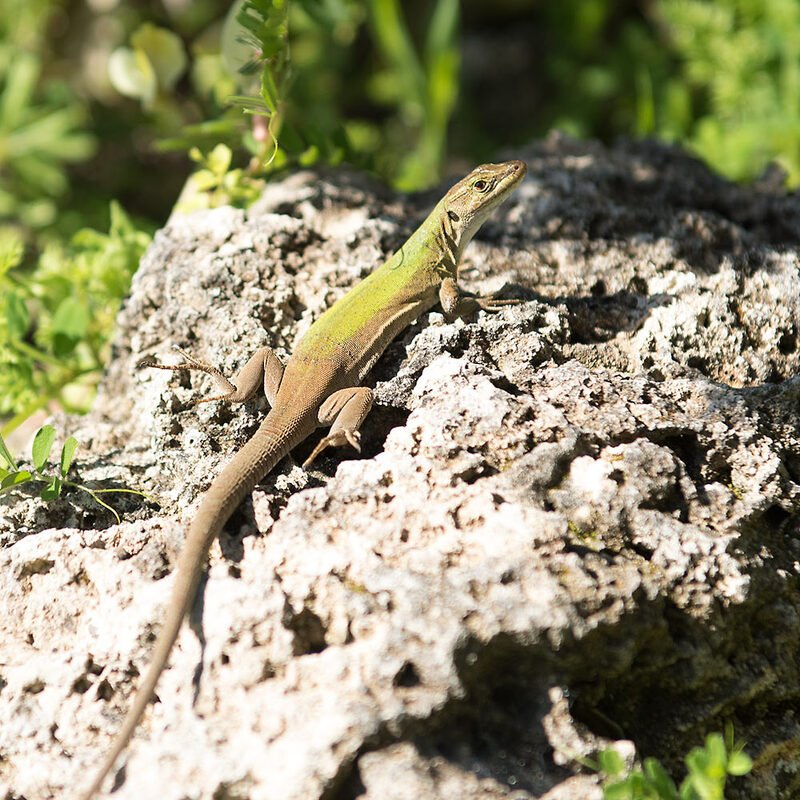 Lizard living in Noto Antica. In the spring, many migrants is passing over Sicily, so this is consider a good time for bird watching. Sicily has a long coastline with good opportunities for watching and bird photography. The salt pans in Trapani is a good place for flamingoes, spoonbills, egrets, herons and other smaller waders. 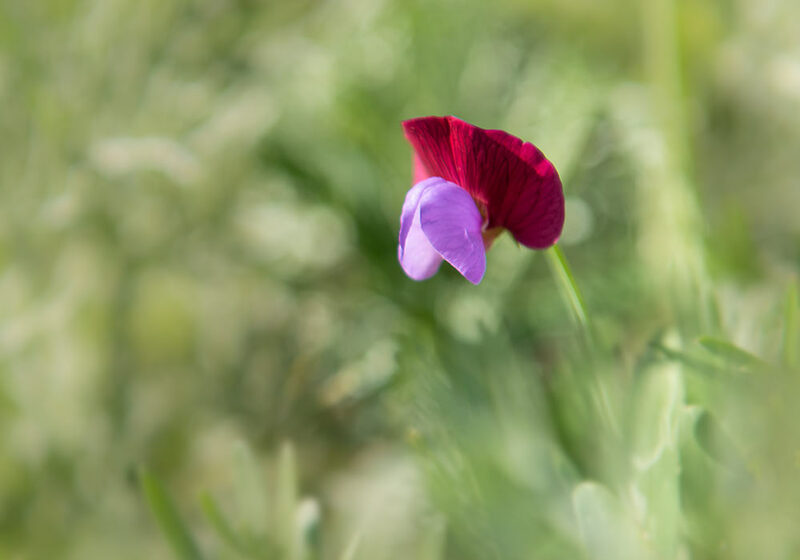 Protected since 1984, the nature reserve Vendicari (Oasi Faunistica di Vendicari), some 10-15 minutes drive from Noto, is a wetland of great interest for its wildlife. In the spring, many birds cross the straits between Sicily and the mainland. Climbing Etna you can see birds of prey. Together with seven other cities in the Val di Noto, the baroque city Noto is listed among the UNESCO World Heritage Sites. The spectacular facade of the church of San Domenico by Rosario Gagliardi (1690-c. 1762) from Syracuse, "a unique figure who operated in isolation in south-eastern Sicily, and yet was part of the international scene." (Maria Giuffrè: The Baroque Architecture of Sicily) Gagliardi's most important work is probably the cathedral in Ragusa Ibla, Duomo di San Giorgio (built 1744-75). According to Maria Giuffrè, "the true breadth and originality of Gagliardi's architectural designs is only apparent in his numerous drawings, which were probably intended for didactic treatise, or perhaps as a personal dossier to display his ideas, and which can only rarely be associated with actual constructions." The Duomo in baroque Noto by night. 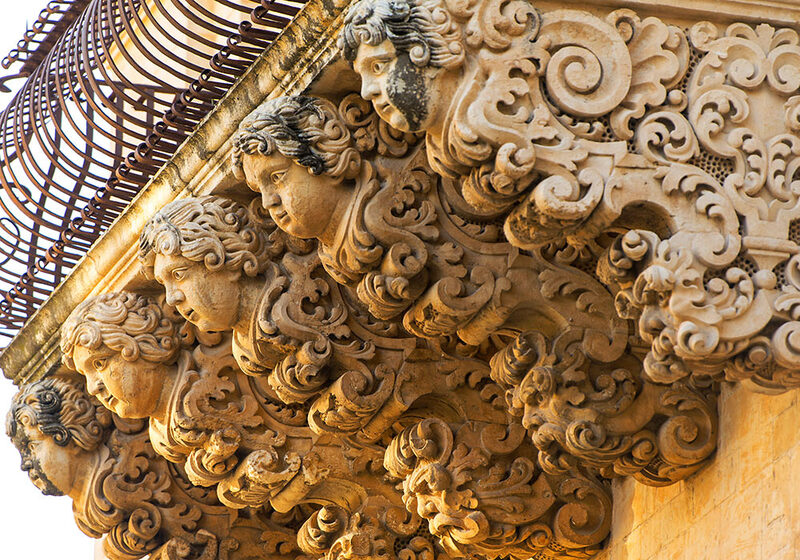 Detail of a balcony on Palazzo Nicolaci in Noto. 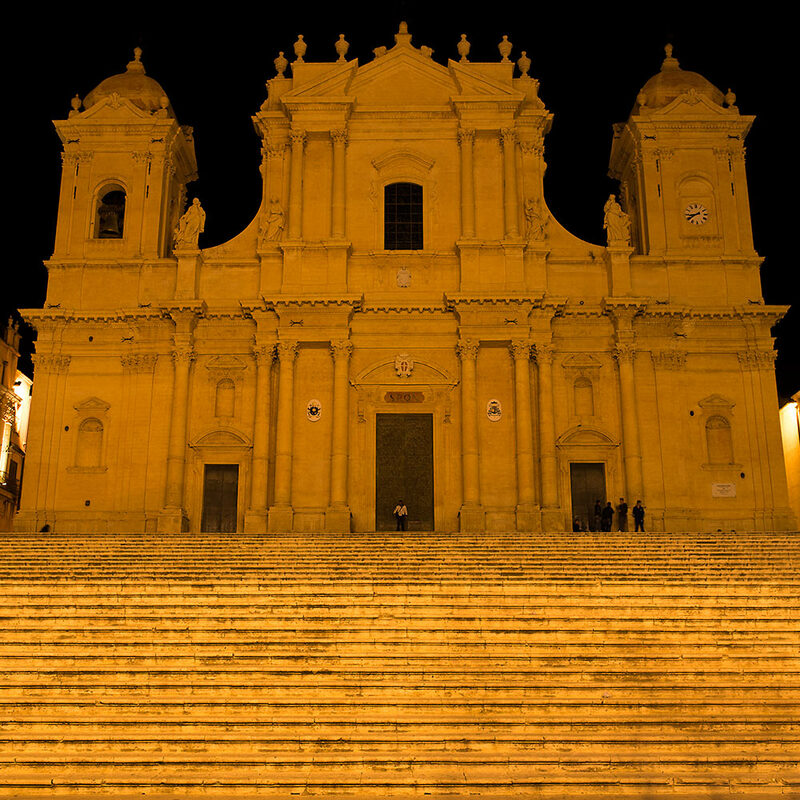 Built after the devastating earthquake in 1693, Noto – planned on a grid system by Giovanni Battista Landolina – has numerous baroque gems to offer tourists, from the breathtaking cathedral (duomo) with its monumental stairway to the incredibly charming baroque balconies. The late baroque towns of the Val di Noto in South-Eastern Sicily that are inscribed on the UNESCO World Heritage List are Caltagirone, Militello Val di Catania, Catania, Modica, Noto, Palazzolo, Ragusa and Scicli. These towns were all rebuilt after the earthquake in 1693 on or beside towns. According to UNESCO, they represent a considerable collective undertaking, successfully carried out at a high level of architectural and artistic achievement. Keeping within the late Baroque style of the day, they also depict distinctive innovations in town planning and urban building. The late baroque towns inscribed on the UNESCO World Heritage List represents the culmination and final flowering of Baroque art in Europe. 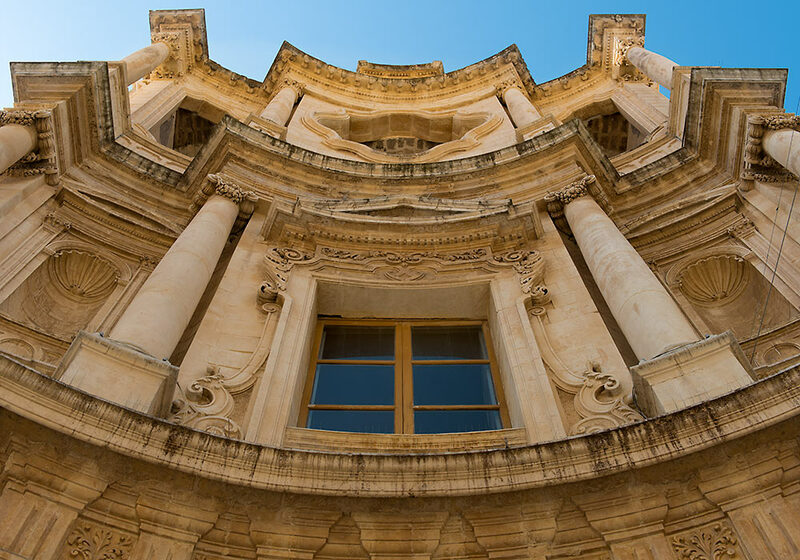 The exceptional quality of the late Baroque art and architecture in the Val di Noto lies in its geographical and chronological homogeneity, as well as its quantity, the result of the 1693 earthquake in this region. 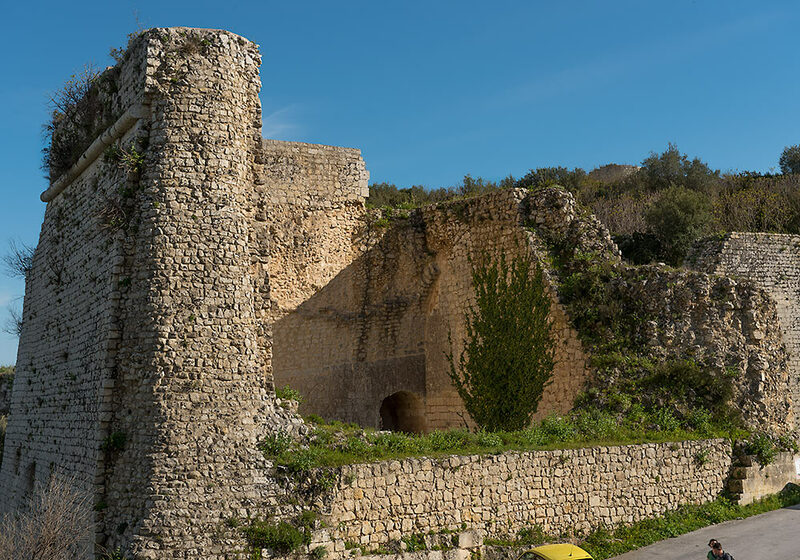 The towns were all in existence in medieval times, characteristically around a castle and with monastic foundations.